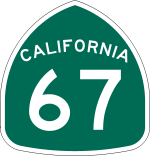 October 17, 2010 (Santee) – Caltrans will completely shut down all northbound lanes on State Route 67 between Prospect and Woodside in Santee from 9 p.m. to 5 a.m. for five nights, starting tonight. The shut-down is needed for construction as part of a $520 million extension of State Route 52 to connect with State Route 67. The north-south route will be blocked off between Prospect and Woodside avenues in Santee. In addition, the work will necessitate detours on Prospect Avenue, between Graves and Magnolia avenues, as well as closures of the northbound Bradley Avenue onramp and Prospect Avenue offramp.